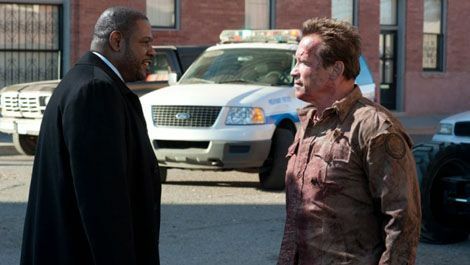 Everyone knows The Last Stand is Arnold Schwarzenegger’s leading man comeback. But it’s also the US debut of bonkers South Korean director Kim Jee-woon ( A Tale Of Two Sisters , The Good, The Bad, The Weird ), meaning its old-as-the-Hollywood-hills story is juiced up with stylistic verve. Arnie plays Ray Owens, a sheriff used to rescuing cats from trees in the comatose border town of Sommerton Junction. Not about to stand aside, Owens delivers a staccato… sorry, stirring oration to his deputies (Jaime Alexander, Luis Guzmán, Zach Gilford) and enlists the help of drunken bad boy Frank (Rodrigo Santoro) and local crackpot Lewis (Johnny Knoxville) to engage Cortez and his weapon-packing goons. Yet most of the madness is saved for the third act, when Arnie’s wild bunch gets hold of a tripod-mounted machine gun and cars start chasing each other through cornfields. Okay, so maybe we could have done without the script’s hoarier cliches (at one point the Feds are reprimanded for having their “dicks in [ their ] hands”), not to mention a tired back-story that requires Arnie to stretch, creakily and none too convincingly, for the dignity of Gary Cooper.